There are few developers that I hold in higher regard than OlliOlli creators Roll7. The British game studio has nailed every idea its had so far, and have had a gorgeous look to all of its 2D titles. So, when I found out that they’d be announcing a new game at E3, I was psyched. Would it be a follow-up to Not A Hero, or their take on a 2D platformer? I couldn’t wait to see what they had up their sleeves. What I wasn’t expecting was a team-based multiplayer game with vibrant 3D graphics and a neon aesthetic that looks like Tron. To say this came totally out of left field from a consumer’s perspective would be an understatement, but I learned from founder Simon Bennett that the idea for Laser League had been kicked around the Roll7 offices for quite some time. It went from a 2D prototype that they’d occasionally show to other developers, and was something they’d slowly iterate upon on the side. Once they saw that other smaller indie studios were starting to have success with 3D games, they ended up adding to their staff, and decided to make their passion project a reality. While Laser League is very different from Roll7’s previous offerings, it does have some similarities in terms of design philosophy. 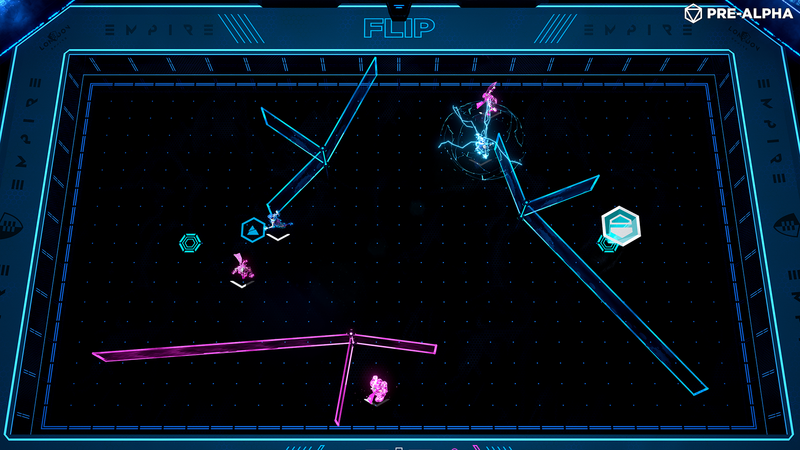 Like the studio’s other games, players can learn how to play Laser League almost instantly. To be successful, all the player has to do is use the left stick to move around the arena and trigger the lasers when they pop up on the field. It’s a simple mechanic that anyone can get used to within a few seconds. Triggering lasers is just part of the equation, however, as evasion is equally important as a good offense. If a player ends up getting hit by an enemy’s laser, they’ll immediately be downed, and will have to be revived by one of their partners. It creates a tense atmosphere where just one mistake separates victory and defeat. In fact, in several of the matches I played, I actually won by doing absolutely nothing (which I like to call the “Luigi strategy”). Lasers don’t stay in play forever, and the stage is constantly rotating between different designs. This means that the race is always on to trigger new death traps, and nobody is ever truly safe. One of the coolest things that I picked up while playing was that both sides of the arena are connected, a la Pac-Man, so I was able to exit the left side of the screen and take players by surprise on the right. There’s a ton to keep track of while playing, and I often ended up being my own worst enemy. Laser League always feels like a very controlled type of chaos, and helping spice things up are a variety of power-ups that’ll pop up around the floor. One of the most powerful ones I spotted was one that would change the colors of all of the active lasers to the opposite one. This can help turn an area of safety into an unavoidable death trap, and it was so satisfying once I managed to wipe an entire team out in just one move. As mentioned previously, Laser League is a team-based affair, and teamwork is vital if a team is to be a success. It’s not only coordinating who activates each laser, but also choosing their special abilities effectively. These skills each run on a cooldown meter, and I primarily chose a class that allowed me to paralyze a foe for a few seconds. This allowed my partner to either slice them with his sword ability, or let one of my lasers strike them. There’s several different classes that I didn’t get to try, but I can’t wait to come up with even more devious strategies. I only got to play about 20 minutes of Laser League, but I can’t stop thinking about it since then. This has all of the potential to be Roll7’s Rocket League, a shockingly fun multiplayer game that is also just as much fun to watch as it is to play. I’m also curious as to how larger matches will change up the dynamics (I only played two-on-two matches), as matches can go up to eight players. Roll7 has an absolute hit on their hands with Laser League. The gameplay is incredibly easy to learn, but there’s so much room for potential strategy underneath the simple gameplay of activating lasers. It’s fast-paced gameplay left me with a smile on my face, and all of my competitive matches devolved into some friendly banter between players. It’s easily the most fun I had during E3 2017, and I can’t wait for it to release next year. Laser League is set to go into Early Access this Summer and will release in 2018 for PlayStation 4, Xbox One and PC. Previewed on PS4.